The house is a modern two storey executive townhouse, tastefully furnished throughout. This inviting and well equipped house features a bright, open-plan kitchen / living / dining area with good indoor/outdoor flow which is superb for escaping from the hubbub of the city. The layout is similar to sister listing (#29360) but has some extra features to increase comfort. Downstairs has the large open plan kitchen/living/dining room with 3 ranchslider doors to deck area and barbecue. There is a downstairs w/g and garage with table football as well as laundry facilities. Whatever your reason for coming to Christchurch, Bartlett By The Park Front is a welcoming house in a fantastic location. *There are numerous cafes and restaurants in the immediate vicinity so you can have a wide choce for coffee, breakfast, lunch and dinner. We have had excellent feedback from our guests in our other listing and will strive to make our new visitors just as happy. Usual minimum booking period is 2 nights. We only take single nights to fill a gap or last minute. Please enquire. We moved to new Zealand from Ireland in 2003 and have made this beautiful country our home. We hope you enjoy it as much as we do. Bright, airy townhouse with outdoor deck. Garage parking. Really well equipped with everything you need. Very well equipped - handy if you want to cook from the Saturday Farmers' market. This is a very well equipped property. It has a generous living area and was very clean. 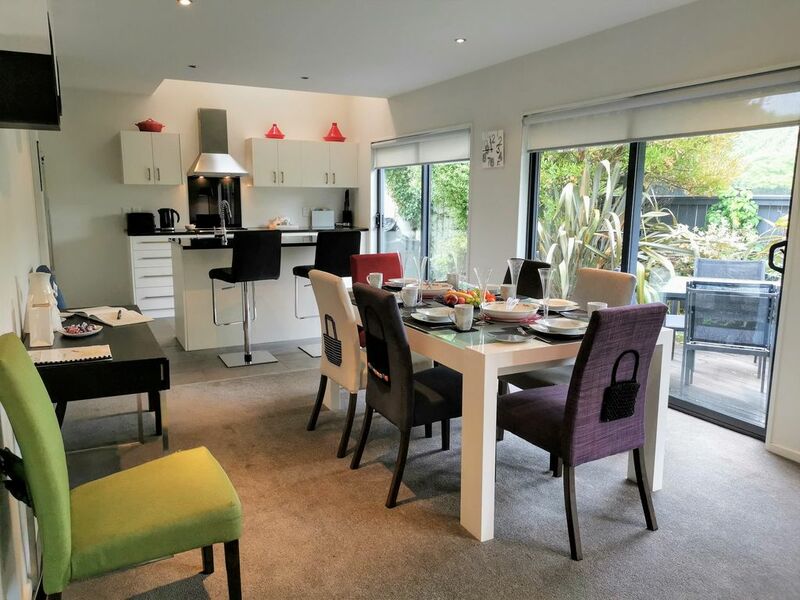 It is less than 100 metres from Hagley Park (about a 15 minute stroll to Botanic Gardens), with several bars and restaurants within an easy walk on Riccarton Road. Very neat and clean in a nice quiet area, located near a wonderful park and not far from city center. Absolute wonderful house! We have stayed at 20 rental properties and this is our families favorite. Absolute wonderful house! We have stayed at 20 rental properties and this is our families favorite. Wonderful comfortable but stylish decor. The beds were comfortable, the bathrooms were well stocked, the pantry was the best stocked, the cooking utensils were numerous! Everything about this house is fabulous. Excellent location, very tidy and quiet, convenient property, very comfortable and well appointed.